When I started blogging, post ideas came to me all throughout the day. I’d scribble them down on post-it notes at work, type in my phone on the drive home (at stop lights…), and generally filled my purse with folded sheets of notebook paper until it was ready to explode. Then, I’d shove all of those papers into a notebook, pick at random for what to write about, write + publish. To say that “system” wasn’t working would be a gross understatement. Does this sound like you? For your sake, I hope not! 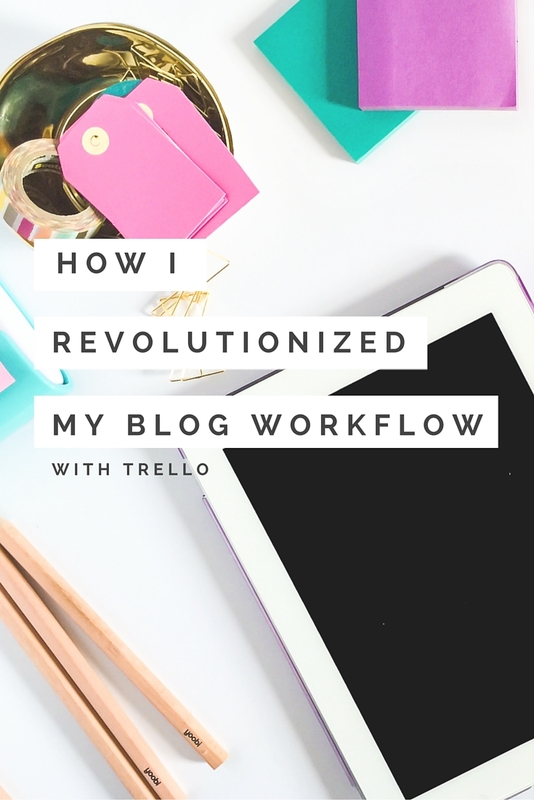 But if it does, take a read on how to organize blog ideas with Trello and how it has completely changed my blog workflow: taking an idea all the way through posting + promotion. I also use this blog planner from byRegina to help me plan the broader themes and monthly overviews. I found it’s more helpful for me to sketch out my big ideas and save the details for digital. This post contains affiliate links, which means if you make a purchase I may earn a small commission. I only recommend what I love + use myself. Thanks for your trust + support of The Shop Files! Before jumping in, below is a quick overview on how Trello operates. This is where you group information at a high level for your process or workflow, think of it as your binder. I use one board and label it “Editorial Calendar”. These are your individual ideas. This is where I list blog post ideas – assigning each to a new card. To complete my analogy, these are the pages you insert in your binder behind each tab as the section develops. So, boards are static like a binder, but all the pieces inside (the lists + cards) can easily be moved around – just like tabs or loose pages (but without the three-hole punching because no one owns those anymore). Cards can move onto a new list or to a new board altogether. Lists can shift in order or move to new boards as well. Here’s a glance at my Editorial Calendar board. I go into details below, but you can see the lists flow from left to right, the colored blocks are labels to help categorize and the due dates are visible at a glance. Don’t mind my creepy blocked off squares – don’t want to give it all away! The goal is to complete each “list” task and move your card down the line. So it goes from Idea to Outline onto actual Writing, then Content Upgrades (optional step – not all posts will have), onto Photos/Image Creation and finally scheduling out Promotions! The idea of using Trello this way really made sense when I read this article from Gregoire Gilbert on how he uses it to manage his sales pipeline. It’s really pretty brilliant and totally clicked for me. Suddenly it was like yaasss this is everything I need. A way to dump all my ideas down, then move them on down the line when ready, and have a pretty view on the status of everything. And if you’re asking yourself – wait, you mentioned an editorial calendar somewhere? Yes! I talk about it halfway down, but check out all the other awesome stuff you can do first! Totally new to blogging and confused where to start? One of the biggest mistakes I see new bloggers make is reading and finding new articles every day… and not taking action. My advice: pick one blogger or book that you respect and enjoy learning from and move throughout their advice to start. After you’re up + running and feel more comfortable, than go back out and search for ways to tweak and adjust. Otherwise, you’re just running in circles from one shiny Pinterest article to the next, getting nothing done. I really respect Abby from Just a Girl and Her Blog and loved her book Building a Framework if you’re looking for a new blogger resource. Example of a card, (shh it’s not really past due, just haven’t archived yet!) Below the “Activity” section, it shows all comments added, when it moved boards, etc. And I’d usually have the “Description” section filled in with my outline, but I moved quickly on this one. A shared team workflow – Just think of the possibilities! 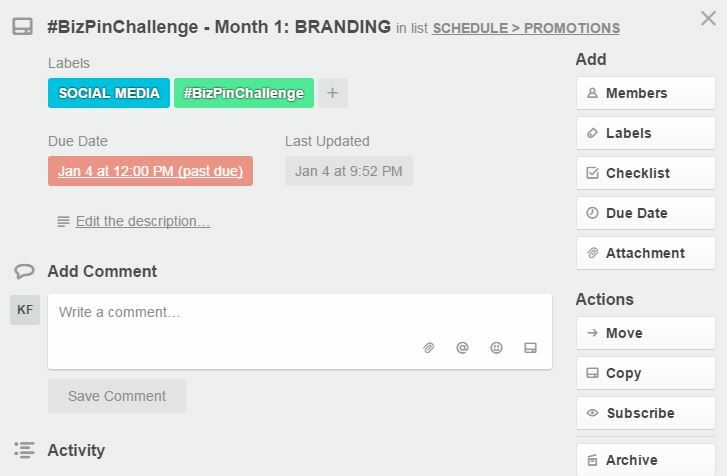 You can see when work is completed, new ideas added, or assign a writer to each post or task. There are two options – Members & Subscribe. I would use “MEMBERS” to assign who is actually related to completing the task and then optionally “SUBSCRIBE” to those cards you’d like to receive update notifications. That way it won’t get confusing on who’s working on what, but you can still stay updated if their work relates to you. Labels allow you to color code + categorize your cards. I have my labels set to my Blog Categories and have 1 for “DO NOW” to help further define my priorities or hot button issues. You can use multiple labels on a card, but think through how that will organize you or keep it streamlined to one. Especially for larger more complex posts, its an easy way to stay focused and break it down into mini steps. For example: when prepping the #BizPinChallenge, I had a checklist for must-do’s before writing post: Determine Categories, Create Secret Pinterest Board, Research Content, Add Targeted Pins, etc… The little check box at the bottom of the card (last card on the right) shows how many tasks you’ve completed, clearly I just jumped ahead on that one, 1/5 ugh. You can attach images, links, resource citations, etc. from almost anywhere – your Computer, Google Drive, DropBox, Box, OneDrive or a link. Talk about options. 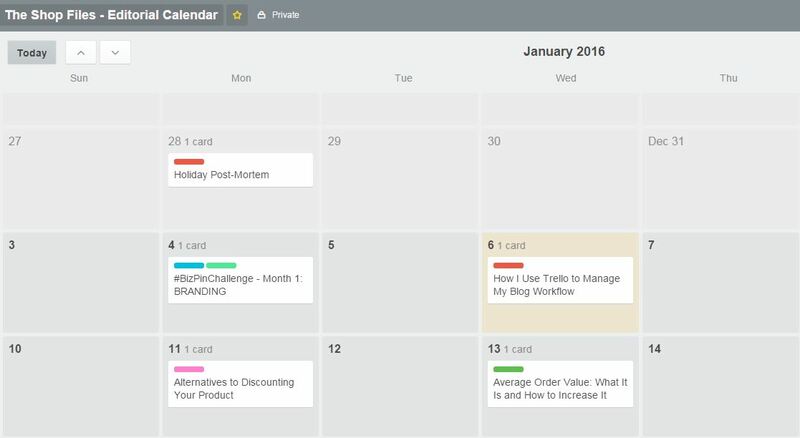 This keeps all ‘working ideas’ and your thought process in one location – the little block of lines at the bottom of the card in collapsed form, like in the Trello one on the board view, denotes there is a description written. Each comment can be those million and one ideas that creep up – follow up with this person or do research into this point. That way you can see your thought process unfold and create more in-depth articles, without ever worrying about leaving “Research this?” in an actual blog post. The speech bubble at the bottom of the collapsed card shows comments have been added. Enable the “Power-Up feature (From your main board view, click Menu in upper right corner, select Power-Ups, enable Calendar). This will work as your full editorial calendar. *Cue angels singing* It shows category labels and post title, see example below! Instead of sitting down with one idea and being forced to write it, Trello allows you to build on ideas, switch them up, add new ones – all while working in one platform. I often find I can crank out several post outlines in a sitting and then go back at a later date to pick one to focus on completing. This gives time to let the piece breathe, come back with a fresh perspective, and then dive in to finish the whole thing. I’ve also found I waste a lot of time correcting + playing around with formatting once I’m in the WordPress editor – Trello allows me to just write. Get out the ideas. Dump them into a card. Worry about proper sentences and formatting later. JUST WRITE. If you set up your labels as blog categories, you can see that particular workflow and focus + prioritize to complete certain tasks by category. Helpful if you’re specifically working to build up that content on your blog or working towards a launch and you’re supporting with specific themed content to promote. When you last added a comment, updated the description or added a link. This can also be extremely helpful if you wanted to use this as a shared workflow for your team. You might be saying, uh of course it should be, but let’s be honest – not all are. It’s easy to use, fairly streamlined and functions well, so you’re really never without a place to put all those ideas. PS. My “outline” at this point is over 1,000 words. Seriously, I just flowwww so much better here. Branding: Pantone color #’s for brand or project, Fonts to Use, Photography image Ideas, etc. Okay, so what do you think? 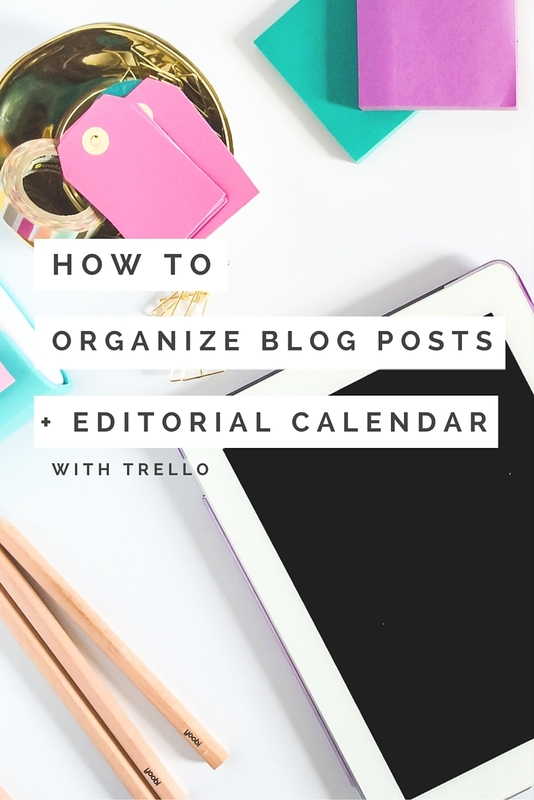 Would Trello help with your workflow and as your editorial calendar? What other workflows could you use this process for: on-boarding clients, gaining new clients, working with new vendors, product/ebook creation, testing new product ideas, the list is really endless – I’d love to see what you come up with, let me know below! Liked this post? Share with your friends + followers by clicking below! Thanks so much Krista, was so happy to see you here! I know – there are so many options out there I was overwhelmed on what to use, but I’m going to put blinders on and stick with this for awhile since its working for me! What do you use now? You’re so welcome – glad we could “meet” last night! I usually do that with online tools too, there’s so many functions it can be hard to see what would be most useful. I hope this helps you out and let me know what you think when you start using it again! Yay, I’m so glad it makes sense for you! I don’t think there’s a “wrong” way :), but this definitely works for how I think and what I need to keep me on track! I love “brain dumps” and this allows me to do that but still within a structure. If you start using it again, let me know – I think once you using it there’s a ton of ways to adapt it so I’d be curious what you come up with! Hi Emily!! thank you so much, its awesome to hear this clicked for you as that’s totally how I felt once I figured it out. So I’m so happy its working for you! This was so educational! Thanks for sharing. I love being an organized freak, but am just starting out and feeling a bit overwhelmed by all the ideas and learning curves. I am excited to start using this. of course, so glad you found it useful! yes, this way totally clicked for me and i’m still successfully using it ha. once I started using it that way, I’ve also found so many other helpful ways to use boards specific for my needs. Hope this works well for you – let me know what cool uses you come up with! Just started using Trello with your advice and I’m loving it!! Thanks! oh I’m so glad!!! It totally changed my flow and finally gave me confidence to plan things out so yay that you’re loving it! yessss!!! It’s seriously the only tool/process I’ve stuck with for years! Thank you so much for explaining all of this. I just started using Trello to organize my client workflow and it’s just amazing. I can’t wait to use your suggestions to organize my blog posts! You’re so welcome! Once you get going it’s amazing all the things I do with it, I have a board for my main “blog notes” to keep track of brand colors, overall goals; another board for praise/testimonials organized by course or blog, etc. The options are endless and so helpful to have all in one place!